wings and other hors d’uvres. Everybody seemed to be in a celebratory mood as they waited for the big moment. 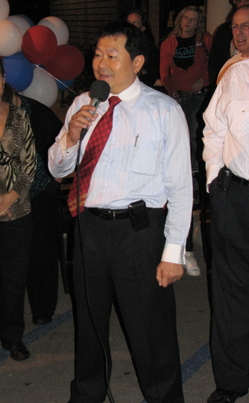 These kinds of events are seldom without a fair amount of pomp, and tonight’s event was no exception. 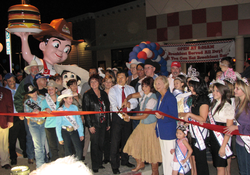 We had presentations and proclamations by various Norco Chamber of Commerce members; city council members; Assemblyman Jeff Miller’s office; Norco’s mayor, Kathy Azevedo; and a seemingly endless supply of Norco and Corona beauty queens. You had your Misses, your Pre Teen Misses, your Junior Teen Misses, your Young Misses, your Toddler Misses and your Baby Misses. 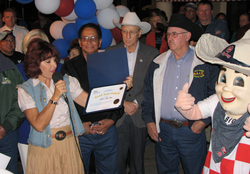 You had your Norco queens, your Norco rodeo queens and your Miss Circle City Corona queens. But Miss Norco? She was missing in action, but I believe all her princesses were there. 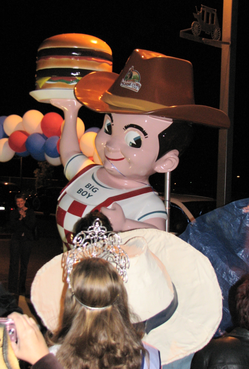 So after all the city folks, the business folks and the beauty folks had their say, it was time to show Cowboy Big Boy to the world. 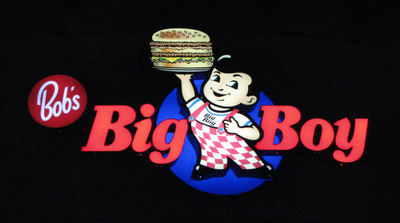 We waited while the owner and the manager tracked down the key to unlock the padlock that secured the chain holding down the tarp covering Big Boy. Then we began the countdown from 20… 19… 18… 17… 16… 15… 14… 13… 12… 11… 10… 9… 8… 7… 6… 5… 4… 3… 2… 1! 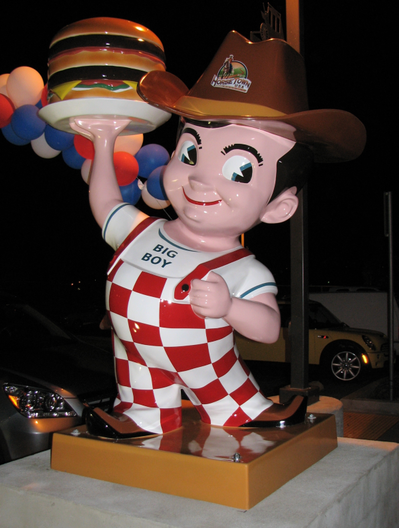 Cowboy Big Boy was unveiled! 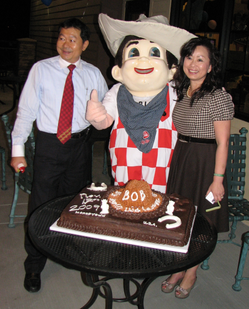 Of course, there was still more pomp to come: Photo ops, a ribbon-cutting and, perhaps best of all, cake! The excitement outside the restaurant slowly filtered inside the restaurant, as diners ate or patiently waited for a table. The restaurant, needless to say, was packed! Employees eagerly doled out the rest of the hors d’uvres to those seated and those still waiting for a seat. They even had a raffle to celebrate the evening, with winners taking home Big Boy goodies like T-shirts, Bob’s seasoned salt and jars of relish. All in all, it was a good time. Really, what else are you gonna do in Norco on a Tuesday night? 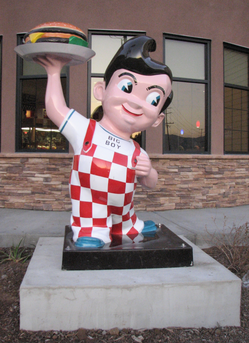 Congratulations, Norco, on your one-of-a-kind Big Boy! Long may he ride. 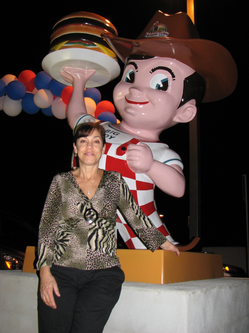 If you want to pay a personal visit to Cowboy Big Boy, head on over to 3521 Hamner Ave. in Norco. This entry was posted in Riverside County by John Plessel. Bookmark the permalink. 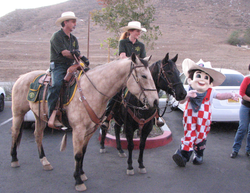 We are from San Bernardino and were at the unveiling of bob last night. Charlye Trujillo is a good friend of ours and she is an AWESOME G.M.!! she works very hard and is so proud of what this has become!! WAY TO GO CHARLYE!! !